When I read that the theme of this month’s Sugar High Friday was “your favorite, most craved dessert,” I was stumped for a while. As much as I love desserts, I really couldn’t come up with a favorite, and even as I write this post, I’m still scouring my brain, trying to decide if something is so obviously my favorite dessert that I was taking it as a given. Nope. I like having New Orleans Sheet Cake around my birthdays in October, but I don’t think I’ve made one for years (so much for most craved, but maybe I’ll do one this fall). I love my great-grandma’s butterscotch pie, but Jeremy’s not a butterscotch fan, and in any case I’ve never gotten it to set up quite right (but neither have my mom and grandma, so I’m in good company. The problem may lie with the lower fat milks these days.) But really, as long as I can have a little sweet something after a meal, I’m happy. So I turned to my husband, and asked him to tell me his favorite dessert. Jeremy is a man who knows what he likes. That’s not to say that he won’t try new things, but once he finds a winner, he sees no need for further experimentation. (One of these days, very soon, I’ll post my banana bread recipe and delve into that a little further….there are some ripe bananas on the counter asking for it.) So I knew what he would say almost before he said it: For quick breads, his favorites are my pumpkin chip muffins and banana bread; for cookies, oatmeal carmelitas, lemon bars and chocolate chip cookies with toffee; for pies, apple with a crumb crust (or apple crisp, forget the pie); and for cakes, German chocolate and carrot. Most of those desserts just weren’t ideal for this SHF, though. For instance, Jeremy always wants German chocolate cake for his birthday, and I just made him a lovely one this February that sadly went unphotographed. The oatmeal carmelitas are generally a holiday treat, and we had lemon bars not too long ago. The pumpkin muffins, banana bread and chocolate chip cookies are all on regular rotation. I’m working on apple crisp, but haven’t hit on the perfect recipe yet, and plan to do some serious research this fall. That leaves carrot cake. This time around, I tried a new carrot cake recipe, and thank heavens, because now I’ve got a new dessert to crave. 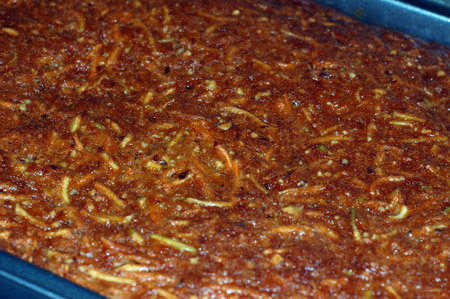 It was my ideal carrot cake, in every way: It employed both honey and grated apple for flavor and moisture, along with lots of carrot and some finely chopped hazelnuts; it ended up with a lovely fluffy texture and lots of flavor; and the honeyed cream cheese frosting was delicious and easily spreadable. I adapted the recipe for a 13×9 pan since I don’t have a good means of storage for layer cakes, and consequently I ended up with a container of extra frosting, which is just a terrible burden, let me tell you. 🙂 We’ll manage somehow. I’ve adapted this recipe from a layer cake to a sheet cake out of necessity. I also just grated the carrots and apples, rather than additionally pureeing them in the food processor, because is that really necessary? It seems to me that carrot cake is really a lot about the texture (just not squishy raisin/pineapple textures, thank you very much). And if you’re going to puree them, why bother grating them first? I used some lovely fresh organic carrots, and grated everything in my Cuisinart, which is absolutely a lifesaver for a recipe like this. And I didn’t bother toasting the hazelnuts this time, because it was getting late. Note: Measure carrots, apples and hazelnuts each after grating or chopping. Prepare the cake: Preheat oven to 350°F. Grease and flour a 13×9 baking pan. Beat sugar, honey and oil together in a large bowl. Add eggs one at time, beating after each addition. In another bowl, sift together the flour, baking power, baking soda, salt and spices. Preferably working by hand, add dry mixture to the oil mixture and blend well. Fold in carrots, apples and hazelnuts, making sure to get rid of any clumps. Pour batter into prepared pan. Bake for 40-45 minutes, or until cake is golden and springs back when touched or an inserted toothpick comes out clean. Cool completely before frosting. 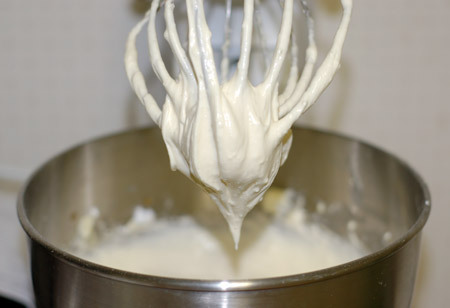 Prepare the frosting: Beat cream cheese and butter together until creamy. Gradually beat in powdered sugar and salt until fluffy. Add honey and vanilla and beat until the frosting reaches a smooth and spreadable consistency. If frosting is very soft, chill until firm enough to spread. There will likely be leftover frosting, so make sure to keep that for midnight snacking…er, I mean another use. Serve frosted cake immediately or store in the refrigerator for up to 3 days. (I preferred it cold; Jeremy liked it both warm and cold.) Both cake and frosting can be made up to 3 days in advance. 10-12 servings. I have always loved carrot cake – the more icing the better. For me carrot cake has to have raisins too. This looks great, thanks for the recipe. Crazy raisin lovers! 🙂 I’m a big carrot cake fan too, but after eating it for a week straight, I’m ready to move on now, and so is the container of leftover frosting waiting in my freezer. Coconut cupcakes, here I come! 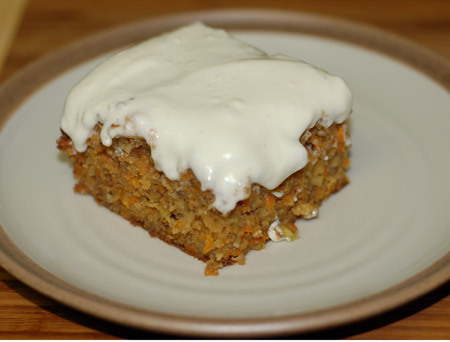 i completely overlooked carrot cake, but i’m a huge fan and often do find myself craving it. such comfort food! lovely take on the cake and thanks for the recipe!